How to order & drink coffee like the French? COMMENTS Comments Off on How to order & drink coffee like the French? 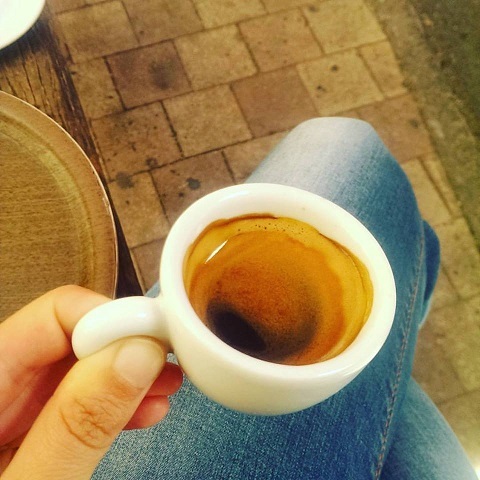 This year is my third season running tours in Avignon, and after so many tours and so many customers, I have come to realise that one of our favourite conversation topics on the tours has nothing to do with the Popes of Avignon or any other history related event… but about the French and their coffee habits. Non, non, non! You do not drink your coffee while walking on the streets! ‘Is there a take-away coffee shop in Avignon?’ I have been asked this question countless times… Yes, there are some take-away coffee shops (After all, France has to adapt to new realities and global culture!) but I am not telling my customers where they are because this is not what we do in France! Have you ever seen a French person walking around with a coffee in their hands? We would think we look silly! I do not see the point of running around with a super-hot paper cup in my hands, and I know I would end-up spilling the coffee on my clothes anyway. No, seriously, French people sit down because coffee is meant to be enjoyed, and more than just a drink, in France coffee is a way to socialize. So, unless you really want to feel like a tourist, go in search of a nice little café, a local bar or shaded terrace, and from there you can start your French coffee experience. Café, Noisette, Allongé…. we have our own ‘coffee vocabulary’ and I know it can be a bit difficult when it comes to ordering. So here are 4 of the most popular coffee drinks in France. Café: The French’s favourite. Le café is a short, espresso-style black coffee that comes in a little ceramic or glass cup (my favourite is the glass cup!). More often than not it is quite strong and comes with small sugar cubes on the side. Noisette : Ahhhh… La Noisette. It is the visitor’s favourite this time! Noisette means ‘Hazelnut’ but we are not talking about a hazelnut flavoured-coffee, just the same small ‘café’ I described above with a drop of milk. If you can’t drink black coffee then this is a good option. Some restaurants will bring your coffee with the milk in it, some others with the milk on the side, in a small jug. Allongé : Literally, allongé means “extended”. This extended coffee includes the same amount of coffee as in the café (espresso style) but double the amount of water. It is not yet the size of an Americano, but if you like to dunk your croissant in your breakfast drink then this is the one to go for. Café au lait ou Café crème : It is usually made with a ‘café double’ (2 cafés) topped with a generous amount of warmed milk and sometimes milk foam as a final touch. This drink is very popular for breakfast.